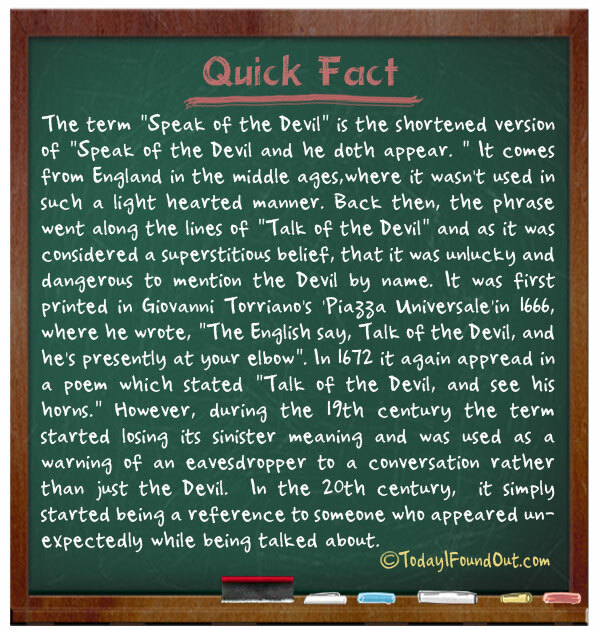 The term “Speak of the Devil” is the shortened version of “Speak of the Devil and he doth appear. ” It comes from England in the middle ages,where it wasn’t used in such a light hearted manner. Back then, the phrase went along the lines of “Talk of the Devil” and as it was considered a superstitious belief, that it was unlucky and dangerous to mention the Devil by name. It was first printed in Giovanni Torriano’s ‘Piazza Universale’in 1666, where he wrote, “The English say, Talk of the Devil, and he’s presently at your elbow”. In 1672 it again appread in a poem which stated “Talk of the Devil, and see his horns.” However, during the 19th century the term started losing its sinister meaning and was used as a warning of an eavesdropper to a conversation rather than just the Devil. In the 20th century, it simply started being a reference to someone who appeared unexpectedly while being talked about.